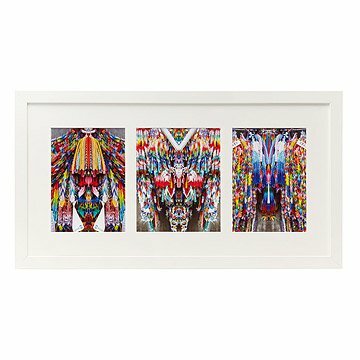 Featuring a trio of paper crane sculptures, this set of mirrored photographs adds a bright spot to your decor. While visiting the Hiroshima Peace Memorial, artist Annie Kielman was struck by the hundreds of origami cranes that had been left there. The brightly colored paper stacked and swayed into large geometric formations that were equal parts chaotic and serene. Annie snapped photos of the sculptural homage, then mirrored the results to create a triptych of dazzling, colorful design. Designed in Chicago, Illinois. Printed in Portland, Oregon. Annie Kielman is a Chicago resident who received her MFA in printmaking from the School of Art Institute of Chicago. Her practice focuses on a constant attempt at perceptual readjustment. The work stems from an exploration of a deliberate distortion of form— utilizing subtle tweaks that create intrigue simply because they are counter-intuitive. Her process undulates between sculptural and print mediums, investigating strange relationships that blend what is perceived and what is seen. I view this constant movement between 3-dimensional to 2-dimensional work as a method of translation of processes that allows for one medium to alter another.